Many thought that the Penguins would free fall out of the playoffs after losing Evgeni Malkin for the rest of the regular season with injury, but in the two games since they've won vastly different games against the two teams they're chasing in the Metropolitan Division: 5-3 against the New York Rangers in a fast-paced shootout and 2-1 in OT against the New York Islanders in what was more of a tight defensive struggle. They'll look to keep the momentum going and win their 4th straight tonight against the Carolina Hurricanes. It'll be the 5th and final meeting between the two teams this season, and the season series will be on the line as they've split the first 4 contests 2 apiece. The Hurricanes have been both outperforming expectations and under-performing what their possession stats would dictate for the season. Though they've struggled as of late, they're currently 6th in the league with a 52.3 SACF%, but that's coupled with a league worst 98.3 PDO. They've suffered some bad luck on the season, but it also underscores the fact that this Hurricanes team isn't particularly talented, and they're less so after trading Eric Staal and Kris Versteeg - players that still rank 6th and 7th, respectively, on the team in scoring.The Hurricanes are only 28th in the league as a team with a 8.2 SH%. The Hurricanes are "led" in scoring by Jeff Skinner with 25 goals and 18 assists in 70 games played on the season, but Skinner is beat out only by Nazem Kadri (37 points) for fewest points among players to lead their team in scoring. 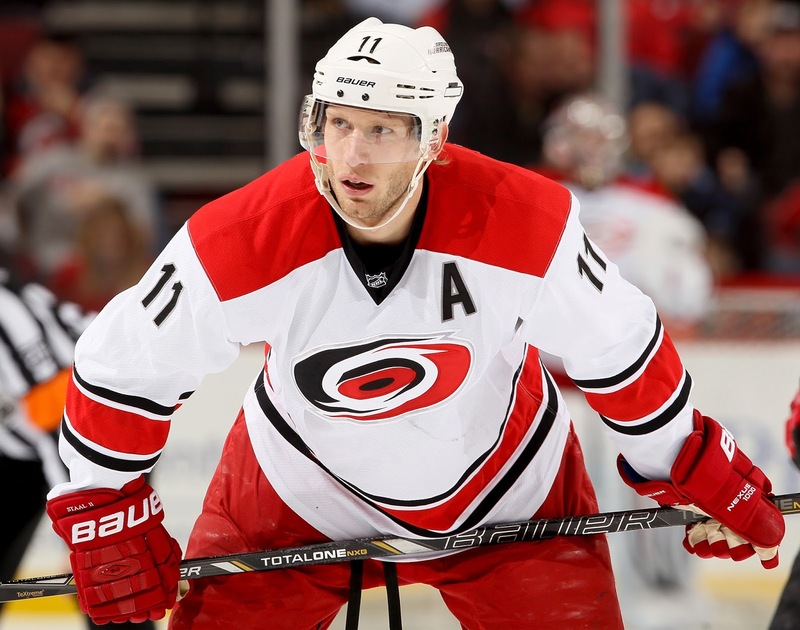 Former Penguins Jordan Staal finds himself in 2nd place on the team with 41 points, and in a display of the lack of depth on the Carolina roster he's currently the top line center for the team after Eric Staal's departure. There's not much to like about the team offensively, but Justin Faulk is certainly developing into one of the better defensemen in the league. The 23-year-old defenseman has matched his career high with 15 goals in just 55 games played and currently ranks 7th in the league for goals on the blueline. Things aren't much better in goal for the Canes, as Cam Ward and Eddie Lack have combined to post a 2.51 GAA and a 0.906 SV%. Cam Ward is finally set to reach free agency after being well below average over the past 5 seasons despite carrying a $6.3 million cap hit over that time frame. It's an albatross that the Hurricanes have had to deal with even after running the general manager who gave him that deal out of town. - While it wasn't originally believed to be a serious injury, Mike Sullivan revealed that the injury to Scott Wilson was going to be a longer-term injury. No timetable has been announced for Wilson's return. - Sidney Crosby will be looking to extend his 9 game point streak tonight, and it would be his second double digit streak of the season after going 11 straight on the scoresheet from January 12 through February 8. - The Penguins will celebrate the city of Pittsburgh's 200th anniversary with a commemorative patch and various pregame festivities. - Matt Murray will get the start tonight against Carolina, and he's done well in 6 appearances this season with a 0.934 SV% and a 1.82 GAA. With the Penguins playing back-to-back games against the Flyers and Capitals this weekend, it would seem likely that Murray will get another start in one of those two games as well.